Are you looking for a new backup appliance? Have you heard about Stress-Free backup storage? Is it really a Stress-Free backup storage? On this blog, I will share my experience with you about configuring ExaGrid and Veeam integration. We will go through it step by step, starting with the ExaGrid configuration, and then the Veeam integration. And at the end, we will try to answer the claim: Is ExaGrid really a stress-free backup storage? Important Note: On this blog, I will go through my tests of the Veeam-ExaGrid integration, and will share my observations and recommendations based on my own learning and experience. My testing is independent of Veeam Software or ExaGrid. I am excited about the Veeam and ExaGrid backup target integration, and these are the reasons: first, that ExaGrid very kindly supplied a demo unit to be used in my CloudOasis lab, and the second is my user experience with the new ExaGrid backup target technology and its streamlined integration with Veeam. The second reason is more important to me, and you, my blog readers, as the technology is our focus in this blog. The word has been out about Veeam and ExaGrid integration for some time now. I haven’t had much hands-on experience with this integration, my one engagement with it being with a customer in Melbourne two years ago. All this changed three weeks ago when I met with the ExaGrid Tech representative for ANZ. He arranged for a unit to be delivered to my CloudOasis lab for familiarisation and integration testing at first, and then later, some stress testing. We will tell you about that in later blog posts. The blog today is to share my experience over the last week with the new ExaGrid unit. One feature of the ExaGrid technology architecture I think is important is the way ExaGrid treat and process the backup data. ExaGrid is offering a hybrid deduplication appliance, meaning the backup data stream lands first on an “un-dedup” landing zone for fast storage, and deduplicated into the retention zone. However, this might not be how the data is always handled. The ExaGrid backup target employs a very smart algorithm that is always monitoring the performance of the appliance and the backup data stream flow. If the appliance can handle inline deduplication processing together with storing of the incoming data stream, the unit will start the deduplication process in parallel to the storage of the data on the landing zone. the first copy is the temporary data resident in the landing zone. This will be stored until the zone reaches the maximum storage size. At maximum, the appliance will remove some of the old data to free up space for a newer backup data. The second copy is the deduplicated data stored in the dedup zone. This data will not be removed until the data retention policy period is reached. No matter where ExaGrid stores the data, the backup application will see the backup files only once. Up to 32 appliances can be part of the hyper-converged scale-out system, all sharing deduplicated data in the retention area. In addition to storing the backup data, the ExaGrid backup target can replicate the dedup zone to another scale-out system at another site. Only the dedup zone is replicated; this is important when bandwidth is a concern. Fast Veeam VM Instance recovery. To set the scene, ExaGrid integrates with Veeam as a backup target, or Repository. Veeam backs up the workload and stores it on ExaGrid. But, to do so, Veeam must use a data mover service to write to the repository; in this case, ExaGrid. Veeam will deploy and host the data mover directly into the ExaGrid operating system, without the requirement for an additional Windows or Linux server. This saves you a server licence and additional server management. Things to know about the data mover deployment; Veeam deploys, manages and keeps the data mover up to date, not ExaGrid. All that is required is to add ExaGrid as a repository and to provide a username and password to Veeam. We will revisit this later in this section to ensure that you never run on mismatched Veeam versions. Before we start, I am grateful to ExaGrid for their new appliance in my CloudOasis lab. I will go through my experience of the early stages of the appliance setup before I start on the Veeam and ExaGrid integration. The setup was fast and easy after it was racked, stacked, and switched on. After answering a couple of WebGui questions, I was done. The steps we have just completed are a summary of the process, I have not included the license agreement and a few other less interesting screenshots. Still, with those steps included, the whole process takes less than 10 minutes. From the Manage menu, select Security Credentials. Then create the Veeam Share by browsing the Manage menu – Shares. When creating the share, make sure you select Veeam Backup and Replication. From the time I received the appliance, to connecting to Veeam Backup and Replication as a repository, it took less than 30 min. I saw a huge improvement in my backup performance that I had not seen before in my lab. I agree with ExaGrid, their appliance is a real Stress-Free backup appliance in two essential ways, it has easy configuration and excellent performance. 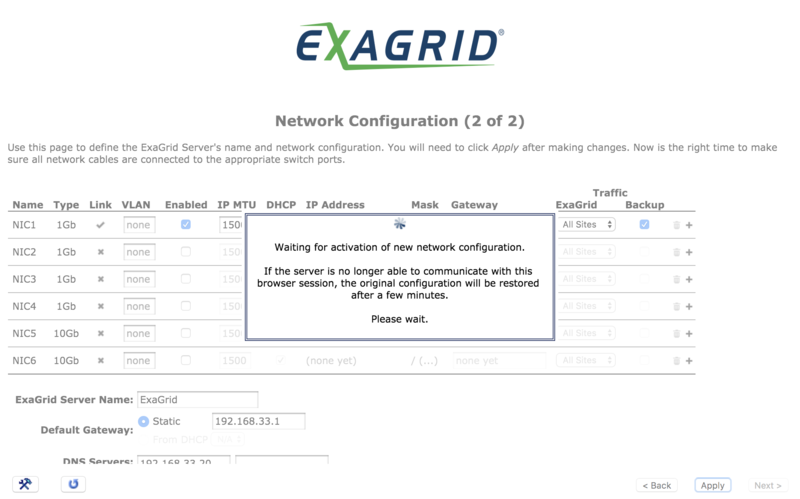 Although I’m excited about the appliance, I didn’t like the ExaGrid Management web interface. It reminded me of my time as a teenager trying to learn HTML. On the other hand, perhaps it is not important when the monitoring of backup performance can be done directly from the backup console in VeeamOne. In summary, with that one small exception, I like everything else about this appliance. I am working on my next test cases; things like the recovery, and others. Of course, I will be sharing these with you. Until then, I hope you find this blog post informative, and please share it.